The return of Gabrielle Restaurant last October was literally the talk of the town. Not “literally” in the way millennials misuse the word, but literally, as in literally. Twelve years is a long time to miss a menu. And few chefs and kitchens have been as missed by locals as James Beard-nominated Chef Greg Sonnier and his beloved Gabrielle. The original Gabrielle—located on Esplanade in the historic Faubourg St. John–opened to critical acclaim in 1992, but like so many of New Orleans’ culinary institutions, was lost to Hurricane Katrina’s floodwaters in 2005. 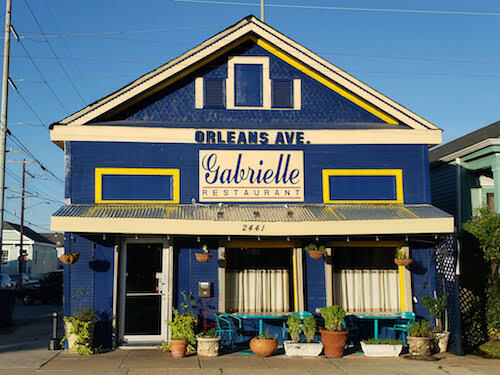 As with its newer Orleans Avenue, Tremé reincarnation, the original Gabrielle was also co-owned by his wife, and then manager and Pastry Chef Mary Sonnier. In the ’90s, the Sonniers’ traditional yet innovative menus were no stranger to praise or print. 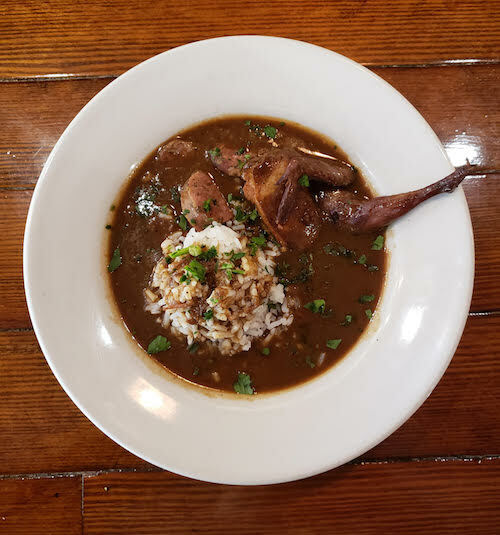 Their combined gastronomic contributions to the merger of Creole and Cajun cuisines and introduction of signature desserts garnered as much national attention then, as Greg’s Quail Gumbo does now. Food & Wine magazine lauded Greg Sonnier as one of the Best New Chefs in America in 1994, long before a New York Times’ writer wrote longingly of his dark slow-roasted and fork-tender duck in an orange-sherry sauce. New Orleans Magazine crowned Greg, Chef of the Year in 1998, while Zagat lauded the “superior and creative” Contemporary Louisiana and Haute Creole cooking at Gabrielle with a personal “hooray for Greg and Mary Sonnier” in 2001. The praise was nonstop. 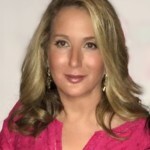 In Gabrielle’s first year, Chef Mary Sonnier was featured on the Discovery Channel’s Great Chefs. Looking back at the series’ webpage’s older photos of a younger Mary and Greg is not unlike looking at a family photo album. It’s the kind of nostalgia this city cherishes as much as it does good food. Mary’s Great Chef’s appearance and Deep-Dish Mango Pie Recipe. Both of the restaurants, the lost and the resurrected Gabrielle, were named for their eldest daughter. Time has moved on, and Gabrielle or now Gabie, then a small child, is now the restaurant’s manager. Make no mistake; this is a family restaurant, a close family. Chef Greg rules the kitchen, Gabie runs the front of the house, her fiancé Marsh Prudhomme is the craft cocktail maestro behind the bar, and wife, mom, and now retired chef Mary Sonnier is still a co-owner. Gabrielle is also what this city holds dear: a neighborhood restaurant. The best kind. Situated under a tin awning in what was once an old New Orleans corner store. It’s the kind of place that in simpler times you could walk to, if only you lived near enough. Your quail gumbo is rightfully being recognized as one of the city’s finest interpretations, how does that recognition sit? It feels good! It’s truly an evolution from the gumbo we used to serve on Esplanade to now. I almost think that gumbo served in New Orleans has expanded to encompass ingredients that aren’t used to in Louisiana. Octopus gumbo is a pretty cool thing to taste. What was your first ever gumbo? 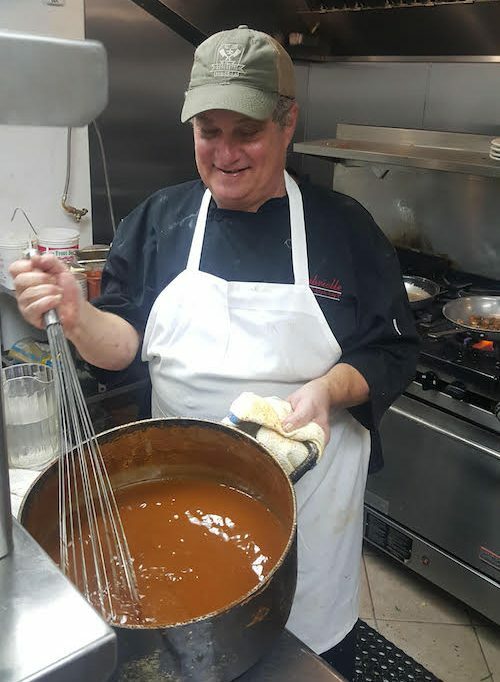 Who taught you how to make a roux? Way back when, what was your first error in making a gumbo (if you ever had one)? What is your favorite gumbo of all time? How often does your family dine on gumbo? Filé or no? Okra or no? My mother’s gumbo was the first I ever had. She was the one who taught me how to make a butter roux, but Chef Paul Prudhomme is the one who taught me the roux we serve in the restaurant. Burning the flour was definitely my first error, but I think that’s true for most people. Seven steak and okra gumbo from K-Paul’s is my favorite gumbo. Usually, my wife Mary will make gumbo for our family when the weather starts to get cold. Saints and gumbo go hand in hand. We never eat file’. Okra yes. What was your inspiration in creating a quail gumbo? This is a new dish I started when we opened, so a little over a year. When making our menu, I didn’t want to put on any chicken dishes. I don’t stand a chance against my neighbors Leah Chase and Willie Mae. That’s where I got the idea for quail. Which techniques can you share to create the already renowned rich smoky flavor and deep color? I utilize the roasted duck “goodness” from our duck dish. That’s what gives the gumbo such a dark color. I also like to make the roux in the oven in small batches. That way I’m able to get it really dark without burning it. Is it on the menu year round? 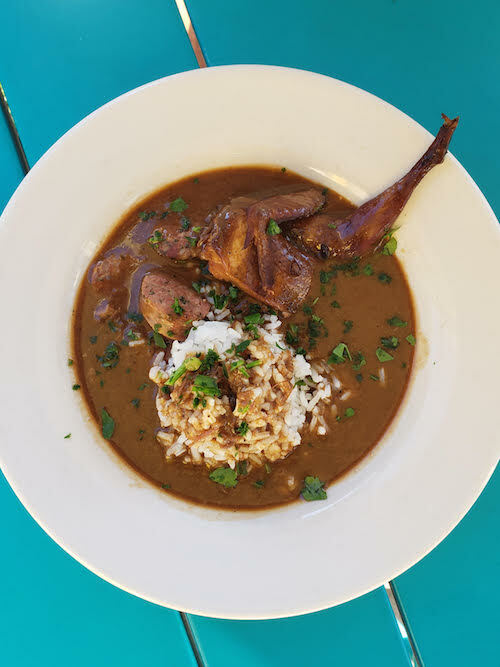 We serve our smoked quail gumbo year round. It seems to stay popular even in the hot weather. I like to buy things fresh, so the ingredients that are in season influence my choices most of all. For example, I only like to serve crawfish during crawfish season. Right now we are running a beet and Satsuma salad special because they’re currently in season. Are there any new gumbo variations that you plan to introduce at Gabrielle? I might experiment with frog leg sausage and rabbit. Both are farm raised now. When you don’t feel like cooking, where do you dine out in New Orleans? Where do you seek a style of gumbo different from your own? We go to Pizza Delicious. Their pizza is the best, and we love seeing Mike and Greg. Those guys work hard. Gumbo Z’Herbes from Chef Leah Chase is the best when I’m looking for a different style of gumbo. Twelve years is such a long wait. How does it feel to finally be back in your own kitchen? In certain ways. As every chef knows, operating from a kitchen you’re used to and setting your stations up each day you’re open for business, in the same way, makes all cooks more comfortable and relaxed to work in. I’m happy in my kitchen. I don’t think I’m going anywhere any time soon. Would you like to share any menu plans for your 2nd year? We’re definitely keeping our gumbo and duck dish the same! We just bought a sous vide machine, so we’re experimenting with that. Describe your ideal Gabrielle meal (which of course, must include your signature gumbo). Yes, definitely start with quail gumbo and glass of Gustave Lorentz Gewürztraminer. The second course would be Warm Goat Cheese Salad and a Glass of Albert Bichot Chablis. Next would have to be our Slow Roasted Duck and a glass of Frog’s Leap Zinfandel. Our Peppermint Patti for dessert and pair it with our after dinner cocktail, Café Rouge (dark roast coffee, Remy Martin, Chambord, and whipped cream). And then it would be time for bed! Would you like to share any news with our readers? Due to high demand, we’re opening for lunch on Fridays starting in November! Also, since we’re so close to the Saenger Theater, we’re working on a themed menu to serve while Hamilton is in town in March.